A letter signed by Prime Minister Theresa May was delivered to the European Council on Wednesday morning. Britain's exit from the European Union is officially underway. 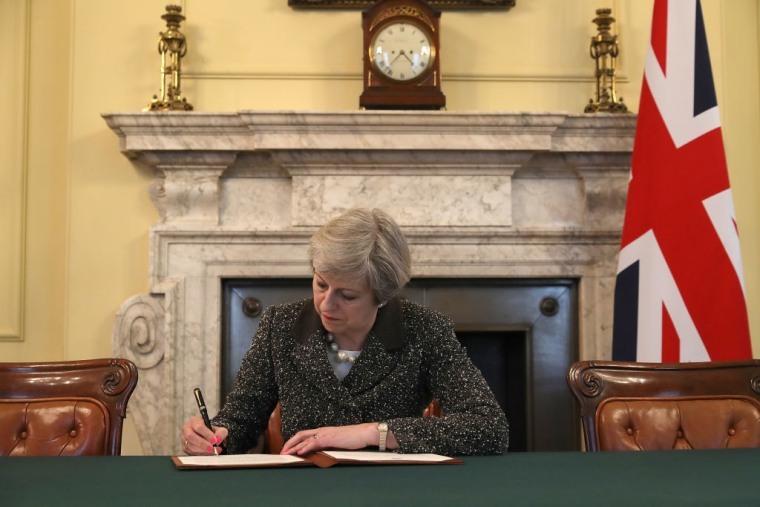 A letter signed by Prime Minister Theresa May was delivered to European Council president Donald Tusk at 12:20 p.m. BST today, March 29. The letter gave official notice under Article 50 of the Lisbon Treaty that the U.K. will begin negotiating its exit from the treaty it joined in 1973. Tusk tweeted to confirm that he had received the letter. Earlier in the day the PM chaired an hour long cabinet meeting and went on to make a statement to MPs confirming the countdown to the departure from the E.U. is under way. She will give an interview on BBC1 at 19:00 p.m. BST on "Britain after Brexit," to mark the occasion. It is expected that the full effects of Brexit should happen in March 2019, if all goes according to plan. For the latest updates follow The Guardian's rolling liveblog.